Traverse the mountainous landscapes from La Paz to Cusco on this active trip that includes a two-day hike centred around Lake Titicaca, visiting ancient ruins on the Isla del Sol and enjoying spectacular sunsets across the lake. Culminating with the awe-inspiring views of Machu Picchu, this is an unforgettable Andean adventure. Lake Titicaca - Hike on part of the Inca Pilgrim Way, visiting Inca ruins and enjoying incredible views over the enormous lake. Tour only clients will arrive and check in at the first nights' accommodation in La Paz. Clients who have booked flights through Explore will spend the first night of the tour on an overnight flight. Today is a free day to acclimatise. Clients who have booked flights through Explore will arrive in La Paz this morning. El Alto airport is at an altitude of 4060m, but our hotel is located in central La Paz, at approximately 3600m. Even with the immediate descent, it's worthwhile spending the day relaxing, or taking your time to explore the twists and turns of the city in a leisurely fashion. Standing at 3636m above sea level, La Paz is cupped in the palm of two magnificent mountains. We enjoy a walking tour of the colourful street markets and the main sites of the city, including the old colonial town and the fascinating Witches Market. Afterwards we have the option to visit the Tiahuanaco, Bolivia's largest archaeological site. It is thought that this ceremonial complex stood at the heart of an empire extending over northern Bolivia, southern Peru, northern Chile and north-western Argentina, but we can only conjecture on how it came to an end. On one of our evenings here we have the opportunity to go and see the spectable of Cholitas wrestling - a popular local spectacular sport (optional). Today we have the day free to explore more of the city. La Paz is a great city to wander around, revisiting the Witches Market for some souvenirs or heading down the charming cobbled streets of Calle Jaen, home to some of the city's bars, restaurants and museums. Alternatively, a really great thing to do in the city is to take a walking tour with a difference. Our supplier in Bolivia is partnered with a collective of local shoe-shiners, who can take you through more local neighbourhoods and markets of La Paz, including the popular 'Belen dining room' where rows of food stalls sell lunches very cheaply to the working population in the area. It provides a fascinating look at this mad city, outside of the usual tourist routes, and will get you closer to one of La Paz's most thriving working communities, which is also one of the most misunderstood. Our Explore Leader will be on hand to translate from Spanish if you choose this option. A morning drive brings us to the small town of Copacabana, standing on a peninsula jutting into Lake Titicaca. We gain our first sight of one of the great highlights of our trip, Lake Titicaca (3810m). The lake itself is immense, the second largest in South America. It was from this lake that the Sun God sent forth the man and woman who founded the Inca Empire, the legendary Children of the Sun. Local people here have larger lungs, hearts and spleens, and blood that is particularly rich in red corpuscles. This has enabled them to adapt to high altitude living. We will re-pack this evening, as tomorrow we take just what is needed for the next two nights. This morning we begin our two-day trek centering on the Isla del Sol. Leaving our main baggage behind, we use our daysacks for personal gear needed during the day and our overnight bags are transported for us. Leaving Copacabana, we walk to Kusijata village then we begin to climb the old Inca road, before descending to Sicuani. From here we take a boat out to the Isla del Sol, landing near the Pilkokaina ruins and soaking up the mystical ambience of an island steeped in the legends of the ancient Inca. Walking up to our ecolodge (approx. 200m ascent +1-1.5 hrs of walking at high altitude), there are spectacular views across the lake, and if the weather holds we should have a glorious sunset this evening. The Isla del Sol is the largest of the islands that lie dotted around this spectacular lake, lying just off the Copacabana Peninsula at the southern end of the lake. The island is covered with nearly 200 archaeological ruins that attest to the importance the ancient Incas attached to this site. This morning, we take a short hike in the morning to discover the vistas over the lake, before walking down to the port and taking a boat to the neighbouring Island of the Moon. Here, the ruins of Inak Uyu (Temple of the Moon) are a very well preserved nod back to the island's ancient history, and an excellent place to take a hike up for more stunning views over the islands. It's a short but steep hike that takes us above Inak Uyu to the island's peak. We return later this afternoon to the Island of the Sun, and walk back to our ecolodge. This morning we return across the lake to Copacabana and then take a charter bus across the border into Peru, following the shores of the lake to its north western corner and the bustling town of Puno. This afternoon there may be an opportunity to visit Uros Islands (optional) - made entirely from reeds grown in the lake, these unusual man-made islands are home to small village communities. 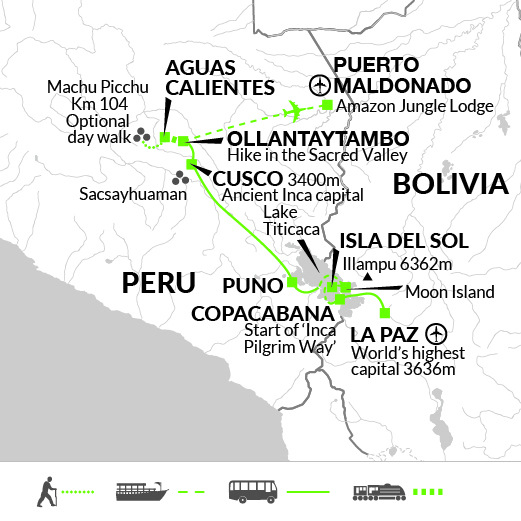 Today we follow the legendary route taken by the first Inca ruler - Manco Capac - on his way to find Cusco. During our public bus journey we drive up to the northern limit of the Altiplano, crossing La Raya pass (4,335m) and descending via the Inca temple at Raqchi to Andahuaylillas. Here, an old colonial church appears as if out of nowhere - we'll be able to visit before continuing our journey. The scenery is desolate but magnificent and we may spot flocks of llamas and alpacas grazing on the windswept pastures. We arrive at the fascinating mountain city of Cusco in the late afternoon and check into our hotel. The total journey is approximately 10 hours including stops. There is also the possibility today to take the classic rail journey from Puno to Cusco (optional). One of the great railway journeys of the world, this full day trip covers some spectacular scenery over the high altiplano. It includes a meal aboard the train, with the chance to try some local delicacies and make use of the outside viewing platform before arriving into Cusco. The old capital of the Inca Empire is imbued with an atmosphere of mystery and grandeur. The Spanish colonial city, with its attractive pink tiled roofs, arcaded plazas and steep winding alleyways, stands upon tremendous Inca foundation stones - enormous blocks of grey granite fitted together with the precision of a jeweller. We take a walking tour of this fascinating city to see Inca and colonial monuments, and also visit the colourful market at Pisac in the Sacred Valley and Cusco's temple-citadel, Sacsayhuaman. For river-lovers there is a the opportunity of a raft-trip (optional and seasonal) down the Urubamba in the Sacred Valley of the Incas. This is an exciting way to see the valley and no previous experience of rafting is necessary - full instruction and safety equipment are provided (grade 2-3). Alternatively, there are plenty of sights to visit within Cusco, including the great food market of San Pedro with its rows upon rows of fresh juice makers, as well as the Inca wall of Hatunrumiyoc with its famous twelve-sided stone (its typical bevelled joints creating the patters of light and shadow so typical of Incan walls). We take an early morning train along the side of the Urubamba river, flanked by high cliffs and peaks up to Aguas Calientes. Those who wish to walk part of the famous Inca Trail will disembark at KM104 just short of Machu Picchu (on the Cusco/Machu Picchu railroad) (optional) - this section of the trail will take you up from the valley floor to the abandoned ruins of Winay Wayna and on to the Gate of the Sun for dramatic views down on Machu Picchu (about 5hrs walking). This option is dependent on Inca pass availability and needs to be paid at the time of booking. For those not wishing to walk we will continue on the train to Aguas Calientes. Once a tiny village of no more than a few houses, this town throngs with travellers and trekkers coming to-and-from the famous 'lost' city of Machu Picchu. For the non-walkers, we spend the afternoon visiting this magnificent city with a local guide. Temples, stairways, palaces and gabled stone dwellings are scattered everywhere, testifying to the energy and ingenuity of the builders. Not without reason this site is probably the most revered attraction in the Americas, its location alone is dramatic in the extreme, teetering on the saddle of a high mountain peak that towers above the valley below. The walkers will arrive in the site in the late afternoon, and take the bus immediately down to Aguas Calientes, where the group reunites again. For those people who walked the Inca Trail yesterday, you will be catching the bus this morning to Machu Picchu for your guided visit of this magnificent city. For the others, your entrance today is not included as you did the site visit yesterday - however, you do have the opportunity to purchase a second entry permit and enjoy some free time within the site. Otherwise, a morning in Aguas Calientes is well spent at the colourful local market or walking along the river that flows through the town. Whether you hiked yesterday or not, it's possible to do another optional hike this morning within the site of Machu Picchu itself - climbing the steep peaks of either Machu Picchu Mountain or Huayna Picchu Mountain to look down on the citadel. Machu Picchu Mountain is a 700m climb from the top of the citadel. There are cobbled stairs all the way up with a few eye-opening drops in some parts, and the round-trip takes about 2.5-3 hours. Huayna Picchu Mountain is only 350m, half the size of Machu Picchu Mountain, but much steeper. There are many more sheer drops, and it is definitely not suitable for someone with a fear of heights. For those who fancy doing the 1 hour climb, you'll be rewarded with world-beating views of Machu Picchu, and the feeling that you're standing on a precipice at the top of the world. These must be pre-paid at time of booking. If you change your passport between your time of booking and prior to travel please take your original passport with you. This afternoon we then travel by train to Ollantaytambo, where we catch our bus to Cusco. The Machu Picchu and Titicaca part of the trip ends this morning. Those doing the Amazon extension transfer to Cusco airport for the short flight to Puerto Maldonado, which is located in the Southern Amazon area of Peru. (Your tour leader stays in Cusco). The Amazon Basin covers two fifths of South America and is shared between many countries including Bolivia, Brazil, Colombia, Guyana, Venezuela, Ecuador and Peru. Most of the area is covered by rainforest - the largest rainforest and the most bio-diverse environment in the world. Sixty percent of Peru lies within the Amazon Basin, the greatest area of Amazon Rainforest after Brazil. You can leave your main luggage in Puerto Maldonado and just take with you what you need for the next few days. The Amazon comprises 60% of Peru and the Peruvian Amazon is the second largest section of the Amazon Rainforest after Brazil. The Amazon basin covers two fifths of South America over many countries including Bolivia, Brazil, Colombia, Ecuador, Guyana, Peru and Venezuela and it is the most bio-diverse environment in the world. Most of the basin is covered by the rainforest, which is the largest rainforest in the world. This evening we will be returning to the boat to search in the dark for caiman along the river banks and in the water. Caiman eyes show red in torch light making them easier to spot. In this area there are mainly white caiman. If you are lucky you will also see some of the other nocturnal animals that roam the river banks. Puno - Uros Islands US$ 30, Titicaca Train £170, subject to availability and cost may fluctuate depending on demand. This must be pre-paid at time of booking and is non-refundable. If you change your passport between your time of booking and prior to travel please take your original passport with you to avoid being fined. Aguas Calientes - For those not trekking - Second visit US$ 70 plus bus to site US$ 25 (bus paid locally)Huayna Picchu Mountain - £60; Machu Picchu Mountain £60 - Subject to availability - these must be pre-paid at time of booking and is non-refundable. If you change your passport between your time of booking and prior to travel please take your original passport with you to avoid being fined. 2. If you are travelling on an Explore tour, Explore buy the necessary permit on your behalf. This is non-refundable and can't be refunded or transferred after you have confirmed your booking. 3. Passes are sold on a 'first come first served basis' and sell out quickly, so we would urge that you book your tour well ahead of your intended travel date. New Inca Passes are released in January of each year so ideally we would recommend that you book your tour at least 6 months ahead and by December for the following year where possible. 4. In order to buy your pass we will need your: full name, passport number, date of birth and nationality. If you change passport before travelling it will be necessary to provide a copy of both passports in advance of travelling and to carry a copy of your previous passport with you. 5. The Peruvian authorities may change the regulations for the Inca Trail Pass at any time. In the event of this we will inform you as soon as possible. The highlands of Bolivia have dry sunny days but extremely cold nights so thermal underwear, a well-insulated fleece/jacket and a thick sweater are essential. Bring a warm hat and gloves as the Island of the Sun can be especially cold during June and July. Bring something warm to sleep in. A light raincoat is recommended. A sun hat and sunglasses are advisable as is high factor sunscreen, due to the thinness of the atmosphere. Bring a swimming costume for the thermal baths at Aguas Calientes. Comfortable lightweight walking/trekking boots, trainers and sandals. One main piece of luggage, a good sized day sack and a small bag for 2 / 4 nights - You will need this for two nights at Lake Titicaca (your main luggage will be stored in Copacabana). Whilst trekking, our luggage for the Inca Pilgrim Way will be carried for us, but your daypack should be large enough to carry warm and waterproof clothing as weather can be quite changeable. Binoculars, torch, water bottle, insect repellent, suncream (at least factor 15), good quality sunglasses and a lipsalve with sun protection. Please note drones are prohibited in most tourist areas in Peru. Trekking poles are recommended. Please note metal tipped trekking poles are NOT permitted - in order to reduce erosion - please ensure they have rubber/plastic tips (not available locally). Water along the trail must never be considered as drinkable. The camp staff provide purified water each day with which to fill your own bottle. 1 litre is the minimum size suitable. Disposable plastic bottles are not allowed on the trail. It is a good idea to add some powdered fruit juice for flavouring. Please note: metal bottles can also double up as hot water bottles. On each trek a first aid kit is carried but you should have your own blister kit, supply of plasters, aspirin etc. (Please do not give medicines to local people without consulting the Trek Leader). Bolivia: Visas are not required for UK, New Zealand, Australian, and Canadian citizens. However, US citizens will require a visa. Please also ensure that your insurance policy covers you to the maximum altitude of 4100m. This tour includes an optional day walk along the Inca trail to Machu Picchu. Perfect for those who want to experience part of this famous walk but do not want to do the whole four-day trek. Your first glimpse of Machu Picchu will be from the Sun Gate. In the Amazon we experience the jungle in the company of people that live there. The Amazon community of Infierno own and operate Nape Lodge. They also own the adjacent land, most of which is primary forest. The lodge staff are from the community and any money generated directly benefits the local population. Learn about the challenges of living in the jungle as well as discovering the fascinating local wildlife.